Like most of you, last night I was glued to the TV watching and tweeting about the 2014 Golden Globes. Amy Poehler and Tina Fey have made the 3 hour award show somewhat bearable, but let's get REAL - everyone just tunes in to see who upstaged who on the red carpet. So let's get to my favorites and least favorites of the night. Lupita Nyong'o - I haven't watched 12 Years of Slave yet so I'm not familiar with her acting chops, but girlfriend SLAYED her first award show red carpet!!! I mean, this red caped Ralph Lauren dress is tailored to perfection! You couldn't ask for a better red carpet introduction. Seriously. Kate Beckinsale - Unfortunately, I didn't see her walk the red carpet, but I practically went into convulsions when I saw her present on stage! I have a major girl crush on Kate, and this metallic silver mermaid gown by Zuhair Murad took my crush to new levels. Love, Love, Love!!! Taylor Swift and Julianna Margulies were also favorites. I don't think I've seen Taylor look more beautiful. Her black and red Carolina Herrera was to die for! It was reminiscent of Old Hollywood Glamour, which I love. Julianna on the other hand, is not someone I usually pay attention to on the red carpet, but this black and gold Andrew Gn deserves a mention. I thought she looked absolutely amazing in it! With so many Hollywood stars preggers, I thought it deserved to have its own category. Olivia Wilde knocked it out of the park in this emerald green Gucci gown. Her baby bump was my absolute favorite of the night. It doesn't get better than this. Naomi Watts and Liev Schreiber both in Tom Ford, looking smokin' hot and walking hand in hand all night. They really look amazing together, don't they? It pains me to do this, especially since I just picked her for my favorite style moments of 2013! But Sandra Bullock really dropped the ball in this color blocked Prabal Gurung. Her hair and makeup looked really pretty, but the silhouette is not flattering and the bubblegum colors are No Bueno. Also in Prabal Gurung was Zoe Saldana, tho during her red carpet interview I heard her confess that the designer coerced into this dress because he made the dress "specifically for her". Maybe she needs to learn to say 'NO' more often, because this dress has too much going on! The beading, the sheer panel, the asymmetrical cut - UGH. Too much!! Her hair and makeup was flawless though. And now for the BIG ONE - Paula Patton in Stephane Rolland Couture. I don't even know what to say to this, other than it looks like her left side decided to revolt and start attacking her. I can't. Who were your best and worst picks? We are so on the same page, girl! The only one I'm iffy on is Mila. I thought the next was too much. I also really loved Amy Adams. Yes! Amy Adams was serving up 70's chic! Loved it. I thought Cate Blanchett was the best dressed in her black Armani lace gown. 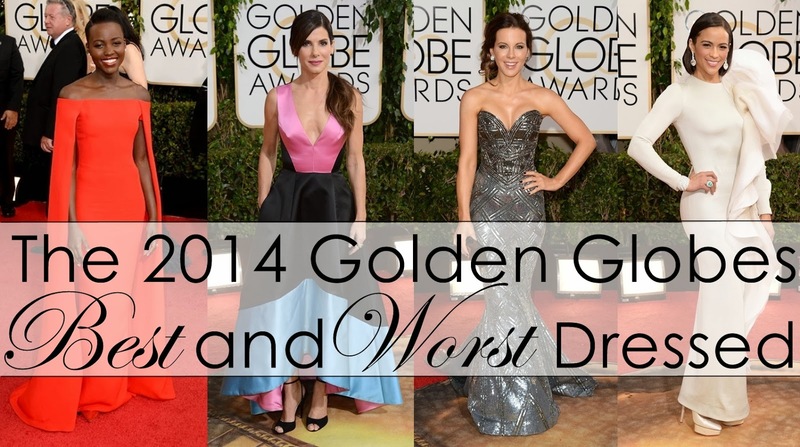 I actually liked Sandra Bullock's dress. The fit was impeccable and it was fresh but still age appropriate. My pick for worst dressed goes to Reese Witherspoon. She looked like she was wearing a floor-length green wife-beater. Cate looked lovely as always. Thanks for stopping by!